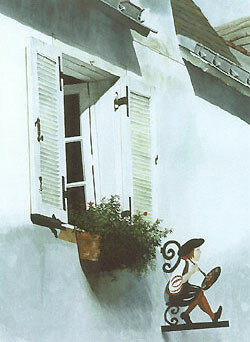 "FRANCE On Your Own Newsletter Galerie"
Prices shown can change at any time at the discretion of FRANCE On Your Own. These very limited edition Giclée prints are produced on museum quality artist watercolor papers and sold with acid-free archival mats and backing, ready to frame. They are shipped with instructions for care and a signed & dated Certificate of Authenticity by the artist indicating the series print (example 5/50). 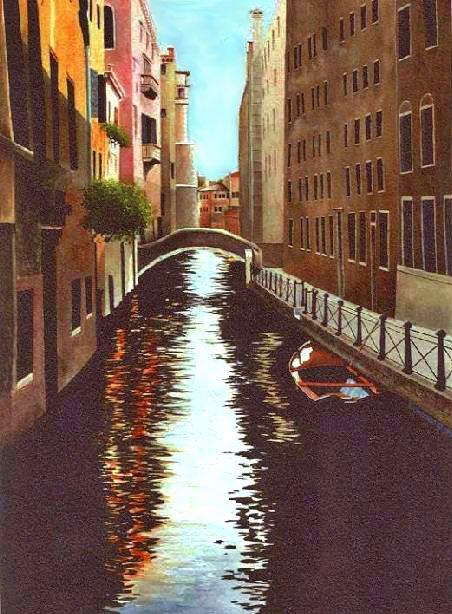 All prints are the exact size of the original paintings. The originals are watercolor and gouache. 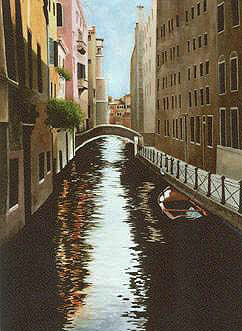 The prices quoted for a print include shipping within the 50 United States. Destinations outside the States will require additional shipping charges. Please ask about those charges when ordering your print. Allow for 4 to 6 weeks for delivery from the date your order is received. 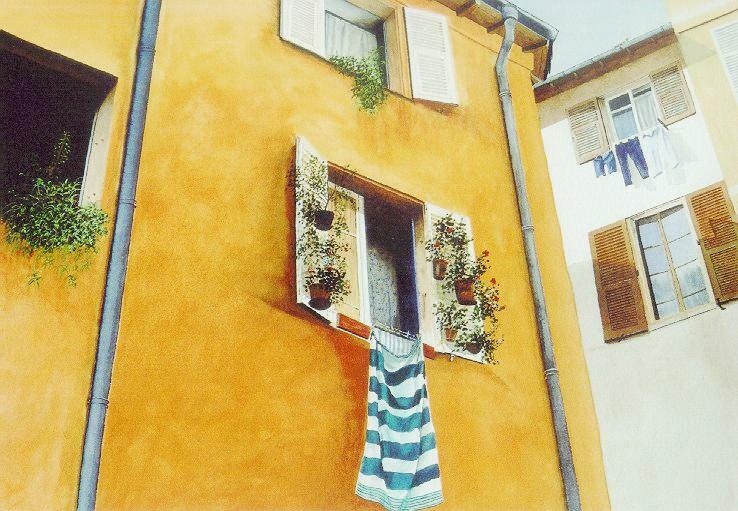 If you must have the painting in less time, contact us by email at watercolors@franceonyourown.com and we will get back to you regarding availability of the print and any costs associated with overnight or express mail. 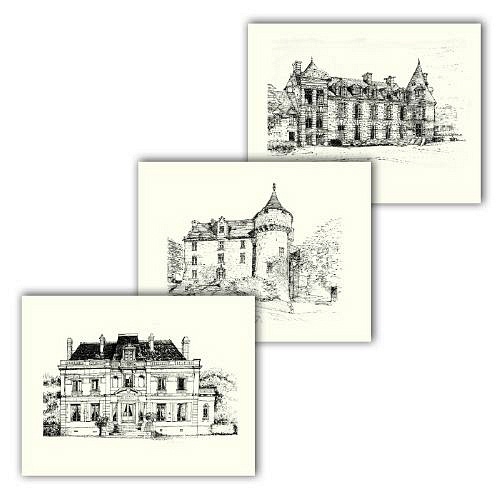 These elegant, ivory-colored classical note cards present our exclusive pen and ink drawings of magnificent château chambres d'hôtes in France. An assortment of twelve with matching envelopes will provide you with a unique and elegant way to drop a few lines to friends or to express yourself with a distinctive thank you message. Our cards also make very thoughtful and original gifts. See our prices below which include postage and handling. Three of the twelve cards (châteaus Canisy, Motte and Foulon) are shown above. 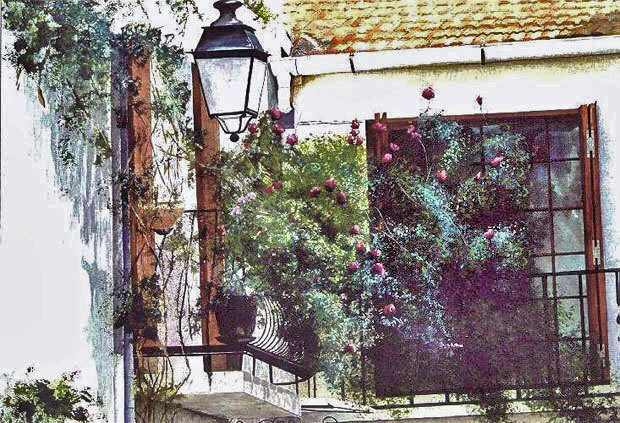 (14 cms wide by 10 3/4 cms high), printed on beautiful matte finish card stock. represented on the face of the card is indicated on the back. $15.50 to the United States / packet of 12 assorted cards includes first class postage and handling. $16.00 to Canada or Mexico / packet of 12 assorted cards includes first class postage and handling. $19.50 to Europe / packet of 12 assorted cards includes air mail postage and handling. Check payments: Mail your check payable to Cold Spring Press with a note providing your full mailing address to the Post Office Box indicated at the bottom of this page. For payments by non-US dollar check, please add 5% to the total amount. Credit card payments: click on the PayPal icon below. Please provide your full mailing address. "Make payments with PayPal. It's fast, easy and secure!" Currently, please allow for 2 - 4 weeks to receive your cards from the date your order is received by FRANCE On Your Own. If you need the cards in less time, please contact us at watercolors@franceonyourown.com for availability and express shipping costs. If your complete mailing address is not provided and we do not receive an email address to contact you, we will not be able to ship your cards. Thank you in advance for remembering! 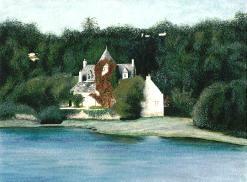 as prints of other paintings become available.